Bernie Sanders, as opposed to Hillary Clinton, has defended the recent attacks on Planned Parenthood as “part of a long-term smear campaign by people who want to deny women in this country the right to control their own bodies.” His full statement follows in response to Republican efforts to stop government spending on Planned Parenthood. “The attempt by Senate Republicans to cut off support for Planned Parenthood is an attack on women’s health. 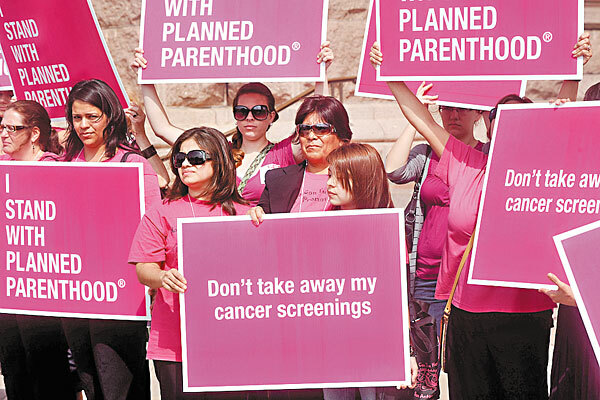 Stripping funding for Planned Parenthood would punish the 2.7 million Americans, especially low-income women, who rely on its clinics for affordable, quality health care services including cancer prevention, STI and HIV testing and general primary health care services. “The current attempt to discredit Planned Parenthood is part of a long-term smear campaign by people who want to deny women in this country the right to control their own bodies. In contrast, Clinton has once again played into the hands of the right wing by calling the videos “disturbing” and calling for a national investigation. Abortion opponents are using illegally obtained tapes to falsely claim that Planned Parenthood is selling fetal tissue obtained during abortions, which would be illegal. Their tapes actually show negotiations over nominal fees for preservation and transportation of the tissue for biomedical research, which is totally different from selling the tissue, and which is both legal and conventional in health care. Posted in Bernie Sanders, Democrats, Health Care, Hillary Clinton, Social Issues. Tags: Abortion, Bernie Sanders, Hillary Clinton, Planned Parenthood. RSS feed for comments on this post.. TrackBack URL. I also believe it is the patient who makes the decision. This discussion reminds me of the stem cell discussions…..we should be doing what we can to find a way to heal. I also do not think Hillary did not throw them under the bus..I think she meant exactly what she said..the videos are disturbing…investigate and stop the hate. Would love to finally have a woman be president of the U.S. But Bernie Sanders believes in and stands for everything I have for my whole life. I will vote for Bernie. Hillary was talking about investigating Planned Parenthood, criticizing them for what the videos showed. She was wrong to give any credence to these videos. Wait until he's a real threat to Hillary. If and when he gets that far the sisterhood and the race-baiters will turn on him. He's too old, too white, and too male. The only thing not wrong with him from the liberal point of view is that he's not a Christian; that would certainly have been one too many, not only depriving him of the invaluable tribal enthusiasm of the Jewish left but engaging the hostility and suspicion of both Jews and secularists. Though her relative social conservatism and instinct for triangulation on social issues will not make it easy for them, the sisterhood, quiet so far, will remind us that the deal in 2008 was that that was the year of Obama, the historic black candidate, and next up would be Hillary, the historic female candidate. They will also start bashing Bernie with everything from his long past that doesn't quite pass a contemporary feminist PC sniff test. Poor Bernie just doesn't really sound as though his consciousness has ever been raised. And the women will join the blacks in belaboring his whiteness and his unfortunate insensitivity to race per se, to blacks in particular and non-whites in general. And that might play nicely into bashing him for his unfashionable apparent loyalty to the two-state solution, traditional Zionism, and the idea of an of course ethnically specific Jewish state, a Jewish homeland in Palestine. Conservatives have already played the race card against him for his opposition to mass low-wage immigration and his opposition to trade policies that have made the rich richer as well as the Chinese, the Mexicans, and others, all at the expense of American working people. Both his ethnic Zionism and his American nationalism put him at loggerheads with the anti-nationalist cosmopolitanism of most influential younger liberals, notably Jewish ones, and will certainly come under fire if he rises to the point of posing a significant threat to Hillary, or even of influencing her positions. He will get out of this long campaign all smiles only if he never really threatens Hillary.